The province is working with a harm-reduction agency in Lethbridge to provide lifesaving medical supervision on Kainai First Nation. 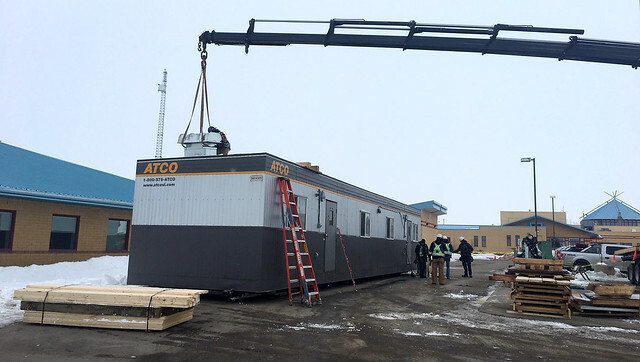 The Alberta Health Services' ATCO trailer has been set up in Stand Off, Alberta to provide lifesaving medical supervision to help prevent opioid overdoses. The initiative will help the community respond to a spike in opioid overdoses. The harm-reduction agency, ARCHES, opened the service in Stand Off today. The services will be available from 2 p.m. to 10 p.m. daily. People can go to the site to use their own substances under the medical supervision of staff who will intervene if they witness an overdose. Kainai First Nation declared a local state of emergency on March 2 after reporting a spike in overdoses from fentanyl and opioids. Between Feb. 23 and March 2, the Blood Tribe Department of Health reported 150 emergency calls related to opioids. The trailer was previously used as the temporary supervised consumption site at the Sheldon Chumir Health Centre in Calgary, until a permanent space opened in the Chumir centre mid-January. It’s equipped with four drug-consumption booths and can accommodate seven people at one time. Alberta Health, AHS, ARCHES and Kainai Nation have been working closely to bring additional life-saving supports to the First Nation. More than 300 additional naloxone kits have been sent to the community, as well as AHS addiction and mental health staff to provide ongoing support and training. Opioid dependency treatment is available at the Cardston AHS clinic, 30 kilometres south of Stand Off. There are 118 patients receiving treatment at this clinic, with new patients being added weekly. Associate Minister Brandy Payne secured federal approval to deploy the trailer to Stand Off. The government is also providing $200,000 for ARCHES to operate the site. ARCHES began offering supervised consumption services in Lethbridge last month. In its first week, the site had more than 250 visits. Staff reversed four overdoses and administered oxygen on numerous occasions.